Asni the Harper performs and improvises on medieval, renaissance and baroque harps. Her performing career has taken her all across Europe and the US, New Zealand and Australia. Asni the Harper is available to perform at weddings and private functions in the Wairarapa and Wellington region, and will consider travelling further abroad if adequate remuneration is offered and all expenses covered. 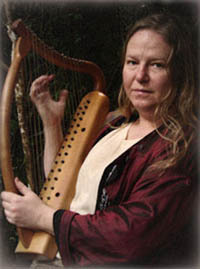 Her repertory includes classical and traditional tunes, medieval songs and contempory popular music, including items from the "Lord of the Rings" film soundtrack. Asni is a highly skilled and qualified music professional with a well established international reputation in her field. As such, she will expect professional remuneration for any music and performance related projects. Hourly rates range from NZ $ 150 for background music or repertory pieces. The minimum fee for events on the South Island is NZ $ 800, plus travel expenses including a ferry return ticket for a car, and car mileage, as well as at least one night's accomodation. If you wish to discuss performances overseas, she will consider fees of Euro 1000 (or equivalent) and above, plus accomodation and a reasonable portion of the travel expenses. Please do not waste your or her time with an enquiry, if you are not able or prepared to offer adequate professional remuneration for her work.